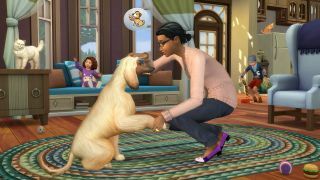 The best Sims 4 expansions for more family fun. If you feel like you’ve exhausted all that The Sims 4’s base game has to offer, then don't worry: the fun is just beginning. While it doesn't have as many game-changing extras as the rest of the series, there are some pieces of DLC that are well worth checking out, both among its larger expansion packs and smaller game packs. Here are the best five, ranked. Get Together adds a new world called Windenburg, a North European-style town that’s a mixture of old beamed buildings, ancient ruins and slick coffee shops. It’s one of the prettiest locations in the entire series. However, the best thing about Get Together is its clubs, which are a chance for your Sims to meet up with like-minded folk. The ready-made clubs include options for book-lovers, fishermen and gym bunnies, but it’s when you create custom clubs that the fun really begins. You can start a group dedicated to almost any activity the game and add your own hilarious window dressing: everything from a homework club to a gathering of gardeners dressed in Star Wars outfits is on the table. What’s more, you can influence your followers outside of gatherings and infiltrate rival clubs, manipulating their members as you see fit. Basically, it’s a chance for lots for mischief. Plus, it makes your Sims feel like they belong to a group outside of the people they live with, giving you more reason to leave the house than ever before. Supernatural packs aren’t to everybody’s tastes, but if you’re keen on making The Sims even weirder then Vampires handles the occult about as well as any other expansion in the series. Your vampires will have a range of fun abilities: they can unlock doors in other homes, make their enemies hallucinate, or enter the minds of other Sims to learn all about their personality traits. Vampires weaknesses can add a lot to a playthrough, too. Your sim might hiss uncontrollably during conversation or—my favourite—feel guilty when chomping on the neck of somebody without their permission, which is sweet. Speaking of neck biting, vampires don’t have bladder or food meters, and instead must keep their Vampire Energy and thirst for plasma (blood, basically) topped up, which completely changes your daily routine. Being able to change your Sims’ regular and vampire appearances separately is neat, but turning your Sims into bloodsuckers feels like much more than just a reskin: it gives them a completely different life. Cats and Dogs doesn’t let you control your pets like you could in previous games, which puts some fans off, but this expansion is still worth considering. The level of customisation for your pets borders on the absurd—you can create a cute pug or a huge, pink, furry monstrosity dressed up like a taco with a skeleton outline spray-painted on its torso. It’s your choice. Each of your pets has traits and quirks, and I like the fact that their desires are more hidden than in previous games. It makes them feel unpredictable, much like actual cats and dogs. You have plenty of ways to interact with them, whether you want to brush them, play fetch in the park, go for a jog or train them to roll over. The cross-breeding tools are similarly deep, as Chris found out when he combined raccoons and cats to create the cutest animal ever, and the addition of veterinary clinics is plain silly. You can start with no experience and build up a neutering empire in no time. It’s not as robust as other Pets expansions in the series, but it’s pure, chaotic fun. Parenthood expands the horizons of both young Sims and care-givers. On the child’s side, it introduces a new set of attributes that track development, including how responsible they are, or how well they have their emotions under control. It feels more meaningful than just watching meters tick up and down, with Sims able to gain new traits—good and bad—that will affect them later in life. The expansion makes being a parent feel like a heavy burden rather than just something passive, which I like. Trying to control an unruly toddler is a real challenge, and balancing the joy of messing with your child’s head—by convincing them the Earth is flat, for example—and wanting to create Sims that will grow up to lead decent lives creates constant conflict. You can scald your child for throwing food all over the carpet and, if your kids are especially rowdy, forbid them from leaving the house of playing with toys for 24 hours (although they can bend the rules, which is a nice touch). It’s not all that much like being a parent, but it adds a lot of depth where it was missing in the base game. City Living’s new world, San Myshuno, feels almost like a separate game. Most of the city backdrop is just façade, but it’s nice to look out the window and see skyscrapers, plus each of its four neighbourhoods feel distinct. They’re packed with Sims walking around, and each has unique activities. In Uptown you’ll be swigging cocktails in a fancy rooftop bar, while the Spice Market is a great place for chowing down some ramen and playing a pickup basketball game. It’s a shame that you can’t build your own apartment complexes (or demolish some walls in individual apartments), which means you’re stuck within a rigid building structure. But that does make you think about how you use your space, which encourages creativity. Taking a run-down apartment with leaking pipes and a rodent infestation and turning it into a clean, minimalist paradise is a great feeling. The secondary additions can create completely new playstyles, too. The new careers—Politician, Critic, and Social Media—give you the option of working from home, which is a welcome alternative to the daily commute. Overall, City Living is the closest The Sims has come to recreating an urban metropolis, and for that it’s a must have.